WASHINGTON — Aircraft-tracking startup Aireon is borrowing $200 million through a Deutsche Bank-led group of investor funds, the company said Jan. 16. Aireon said it signed the credit facility Dec. 21, and that it used the new funds to pay satellite operator Iridium $35 million before the end of 2018 for hosting its sensor payloads on the Iridium Next constellation. Each of the 81 Iridium Next satellites carries an Aireon flight-tracking payload, which linked completion of Aireon’s global system to that of Iridium Next. SpaceX launched the last 10 orbital Iridium Next satellites Jan. 11, bringing the number in space to 75 (66 operational, plus nine spares). Iridium is keeping the last six satellites as ground spares. Aireon CEO Don Thoma alluded to recently secured financing during a Jan. 3 call with reporters, but didn’t quantify the amount. “We will be making some announcements on that very shortly,” he said. Matt Desch, CEO of Iridium, said during the call that Iridium applied the $35 million it received from Aireon directly to the 1.8 billion Iridium borrowed from the French export-credit agency Coface (now BPI France Assurance Export) to help finance Iridium Next. Last year, Iridium borrowed $360 million so it could pay down its debt without depending on Aireon payments. 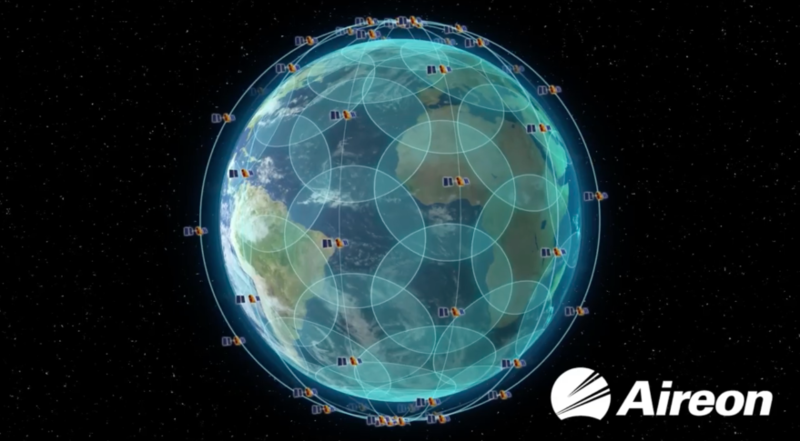 Aireon fell behind on making the $200 million in hosting payments it owes Iridium, in part because Iridium Next delays also hamstrung deployment of its revenue-generating sensor network. SpaceX launch delays and satellite manufacturing setbacks pushed the completion of Iridium Next into this year. Aireon expects to pay off its hosting fee by the end of 2021, having raised $351 million prior to the Deutsche Bank-led loan. “With this financing they just got, they are fully financed well out to cash-flow positive,” Desch said. Thoma said Aireon expects to finish testing its network in March, and begin trials in April, starting with NAV Canada and NATS, two air navigation service providers that are also investors in Aireon. “Our other nine [air navigation service provider] customers will be right behind them with their own operational implementation and certification processes in 2019,” Thoma said. Aireon is still courting the U.S. the Federal Aviation Administration as a future customer. Thoma said a study conducted with the FAA showed that space-based ADS-B, or Automatic Dependent Surveillance-Broadcast flight tracking, over oceans would complement the FAA’s ground-based ADS-B radars. Space-based ADS-B — the crux of Aireon’s business plan — extends flight monitoring beyond the reach of land-based radar. The FAA, which Aireon has been in talks with since 2011, is taking a “step-wise methodical approach,” he said. The FAA has a large impact on global adoption, particularly in Latin America and Asia, he said. Thoma said Aireon is also most of the way through obtaining certification from the European Aviation Safety Agency that would enable the company to provide pan-European service to multiple air navigation service providers.